Home / behind the music / jazz / Read an Excerpt From: "Ella Today (and Yesterday Too)"
Read an Excerpt From: "Ella Today (and Yesterday Too)"
The following is an excerpt from “DownBeat – The Great Jazz Interviews,” edited and compiled by Frank Alkyer and published by Hal Leonard. Read more classic jazz interviews by purchasing the anthology from Backwing. 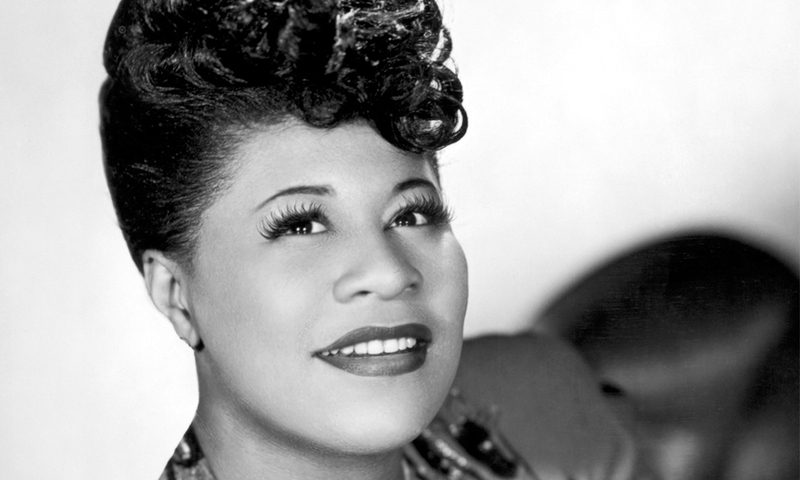 Even when the interviewer is an old friend who met her when she was a gawky teenaged vocalist with Chick Webb’s band, Ella Fitzgerald is scared of talking for publication. The possibility that conversation may become controversy is as unnatural and terrifying to her as the eruption of a flashbulb during the tenderest moment of a ballad. Demons like these have pursued her through a 30-year professional life, and she can never reconcile herself to such supposedly necessary accoutrements of fame, any more than she can adjust completely to fame itself. To put the afternoon on an informal basis, we forgot the interview and talked about her house. A handsome, lawn-fronted Beverly Hills home, with another broad grassy area in the back and a pool beyond it, it offers a variety of creature comforts to which Ella has added a few special touches from time to time, among them some exquisite furniture imported from Denmark, the country she considered her second home for a couple of years. The paneled living room has a bar. On a wall facing us, directly above the stereo set, was a large color picture of Norman Granz; beneath it was a photograph of a good friend and admirer of Ella’s, the late Marilyn Monroe. On either side were photos of Ella at a recording session. She brought out an acetate of a newly recorded album, for which Marty Paich had written and conducted the music. “You want to hear the way I messed up your song?” she asked. As we listened to “Whisper Not,” I knew that Benny Golson would feel about her treatment of his composition— the tempo, the mood, the slight variations—just as I felt abut my lyrics. A few years ago I had learned, the lucky way, that a total understanding of what the Fitzgerald finesse can do for a tune is more easily reached if, like her, you are professionally involved in the writing and/or interpretation of songs. You realize instantly that she knew just what you meant by a certain phrase, that she dug your chord changes or sensed what lyrical point you were to make. You know at once that your few hours of effort have been sublimated by the touch of genius. The remark, made without a trace of rancor, nevertheless had in it a touch of kidding-on-the-square. “Some arrangements,” she said as the conversation veered to Marty Paich, “can really push a singer and make a big difference in the quality of the performance. They can make you sound better than you really are, yet the arrangers very seldom get credit for it. Maybe I feel this way because I started out as a band singer. “And you can tell whether a singer really likes a song or not—no matter how hard they try with something they do for commercial reasons, if it’s a song they are enthusiastic about you can just feel them putting that little something into the performance.” During the “Lover Man” track she said, “Ram Ramirez, who wrote it, was in the room one night in New York, so I did it for him—I didn’t even really know the words. I always felt that there was only one person this song belonged to, and I didn’t want to follow Lady Day. But the audience response made me keep it in, so now finally, after 20 years, I’ve recorded it." We’ve got a huge library of jazz sheet music. Find it HERE.